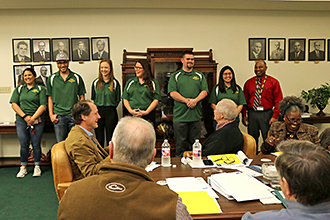 Shown at the Monday, Feb. 25, 2019 Paris Junior College Board of Regents meeting are the students who represented PJC at Community College Day at the Texas State Capitol: from left, Cyan Burkhart, Kyson Hogue, Sylvia Feijen (PJC-Sulphur Springs Center), Tabitha Kelly (PJC-Greenville Center), Johnathan Stevenson, and Giselle Benitez, along with PJC Student Life Director Kenneth Webb. Paris Junior College was well represented at Community College Day at the Texas Capital late last month, regents learned at their meeting Monday evening, Feb. 25, 2019. Cyan Burkhart, Kyson Hogue, Sylvia Feijen, Tabitha Kelly, Johnathan Stevenson, and Giselle Benitez were recognized by the Regents. While in Austin for Community College Day on Jan. 30, the students were able to meet Rep. Dan Flynn and Rep. Gary VanDeaver. All the students took turns sharing their impressions of the day with the regents and thanked them for the opportunity to attend. More good news was received with the spring enrollment report of 4,629 students. This is an increase of 4.54 percent in contact hour generation and in head count of 7.8 percent. Applied Sciences was up 10 percent over the previous year and the PJC-Sulphur Springs Center had an increase of 40 percent. Approved the Student Center Renovation bid from Heritage Construction for $428,300 and including Alternate 1 for bathroom renovation at $45,800. Regents opted for a minimal tuition increase of $1 per credit hour, meaning that a student taking 15 hours will see an tuition increase of $15 for that semester. The increase takes effect for the 2019-2020 academic year, starting with the fall semester. Tuition for dual credit courses will remain unchanged. Received a report on the Board of Trustees Institute attended by Regents Louise Taylor and Jim Bell. Taylor served on a panel, along with Dr. Anglin and El Paso Community College, to discuss being a Texas Mathematics award recipient.